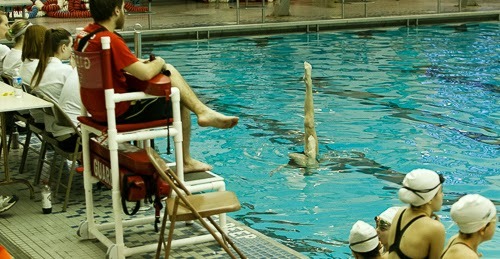 A synchronized swimming meet will often have two very different parts to it – 1) a lively, loud, and colorful part where the athletes swim in teams to complicated and exciting choreography, and 2) a much slower, quieter part where the athletes, all dressed in black suits and white caps, individually perform a single move in front of a panel of judges. This slower part of the meet is called the “figures” competition. A figures competition involves athletes individually performing a single technical movement in front of a panel of judges. Head Coach Leah Pinette: Figures are the more technical side and skills-based side of synchronized swimming. Routines are the more artistic side. Figures help with movement, and they teach the athletes what they should be doing at each age level. Our novices start with a simple back tuck somersault, for example, and the figures get progressively more difficult in the older age groups. Ideally, figures will teach the athletes the progression of how to do certain skills so that, when they are older and ready to do the more complicated versions, they know how to do them. In gymnastics, for example, you wouldn’t try doing a flip without first knowing how to do a front somersault. It’s the same in synchro. You start with something simple and build on it from there. So, the real purpose of figures in this sport is to help build the athlete. "Flamingo Bent Knee" is one of many figures in synchro. ANA Synchro: How many figures are there? Head Coach Leah Pinette: We have a thick rulebook of many different figures. Every four years, FINA (our international governing body) selects eight of them for each age group to focus on. From these eight, there are two compulsories swum at every meet, and then two more are chosen randomly for each meet by the Technical Chair of the Region or Zone. It used to be that athletes would know far in advance which figures would be competed at specific meets, so they’d just focus on those. But today, we find out only 18 – 72 hours in advance of a meet what the figures will be. This is better, I think, because then you have to know all the figures evenly. It’s challenging to know all eight figures throughout the season! ANA Synchro: Why do the figures change every four years? Head Coach Leah Pinette: Different figures get athletes’ bodies to do different things. A new set might include the same set of skills, just at a higher difficulty. Or, maybe the people who run our sport will want athletes to focus on speed or agility, so they’ll add those qualities to the required figures. If they want to see more flexibility in our athletes, they might put a split into a figure. Today, we’re seeing figures that require more back and leg flexibility than we’ve seen in the past. Athletes in the 13-15 age group, for example, are doing the “Ariana” figure, which is very hard and requires a lot of leg flexibility. And, new for athletes in the 16-19 age group is the “Nova” position, which is a bent knee ballet leg position held in an arch, that uses more back and flexibility in the arms and legs. Black suits and white caps for figures enable judges to focus on the technique. ANA Synchro: Why do the athletes all wear black suits and white caps for a figures competition? Head Coach Leah Pinette: It’s supposed to be for the judges so they can just judge the figure. The idea is that if everyone looks the same, then it’s not so subjective. The judges can evaluate an athlete just based on what their skill is on the figure, not on who the person is. ANA Synchro: How are figures scored in competition? Head Coach Leah Pinette: Every athlete will perform a figure in front of a panel of judges. If there are enough judges at a meet, there will often be four separate panels the athletes will rotate through, each one judging a different figure. Each judge will rate the figure on a scale of 1 to 10. The high and low scores get thrown out, and the rest of the scores are averaged together and factored with the figure’s degree of difficulty for an official score. ANA Synchro: Are figures treated as a separate event at meets, just like solos, duets, and team competitions? Head Coach Leah Pinette: Yes, figures is considered a separate event and athletes can earn awards just for their figures results. However, figures scores in the US also count for 50% of the total routine scores. As an example, and just to keep the numbers simple, let’s say a routine scored 60 points and the figures score was 40 points. Their final score would be those numbers added together equally, for a total of 100 points. Another team could have the exact same routine score of 60, but, if their figures score was higher – 50, for example – then they would win the competition with a total of 110 points. ANA Synchro: So, doing well in figures is really important for competition! Head Coach Leah Pinette: Yes. It can work both ways. Figures scores have been known to pull people up in the final standings, but they’ve also pulled people down from where they would have been if you just counted routine scores. ANA Synchro: How are figures counted toward a final score when there are two people in a duet or eight people on a team? Head Coach Leah Pinette: All the figures scores are averaged together. The figures scores of the individual athletes are added together and then divided by the number of athletes in the routine. For a duet, for example, you’d add both athletes’ figures scores and then divide by 2. For a team, you’d add all the athletes individual scores and then divide by however many athletes made up that team. Being a technical swimmer herself, Head Coach Leah Pinette enjoys teaching figures to athletes. ANA Synchro: Were figure scores always weighted so high at 50% of the total final score? Head Coach Leah Pinette: No. I remember when the final score used to be 75% routine score and 25% figures score here in the US. We’ve seen a decline in figure ranking on the international level because we lost our focus on the basic technical skills of our sport. So, USA Synchro decided to put 50% of the score on figures and 50% on the routines as a way to get athletes and coaches to work more on figures. ANA Synchro: This emphasis on figures must be challenging for any coach because the girls probably prefer working on routines, right? Head Coach Leah Pinette: Yes, they do tend to want to work on routines! I suppose I can understand that. It’ harder, mentally, to work on figures and technical skills than a routine. But if the girls want to have great routines, they have to be able to do a ballet leg correctly and know how to scull and spin correctly. And the more advanced they get, the more critical it is to have a strong foundation of basics to be able to learn those harder technical skills. So, every week when I write the practice plans, I put in there how much time we’re going to work on figures and how much time we’re going to work on routines so everybody knows the plan. For Age Group athletes, it’s about 50-50. For Intermediates, it’s about 75% figures and technical work, and 25% routines. ANA Synchro: How did you feel about working on figures when you were an athlete? Pinette: I really enjoyed figures because I was more of a technical swimmer. I didn’t necessarily enjoy practicing figures though! You don’t move around as much practicing figures so I was always cold and shivering! But I loved doing them because they calm your mind and calm your heart rate. I think I excelled at them because I could just focus on what I was doing at the time, at the slower pace, and think of what I could do to improve. Now, as a coach, I have discovered that while I do love routines and the choreography side of synchro, I really love teaching the technical side of synchro. I think the girls have figured this out by how much time we spend on them! I still get the questions from them “when can we do routines?”, but all our work on basics and figures are paying off. Everyone’s figures scores are improving, and I think the athletes are starting to make the connection that strong technical skills mean they’ll have stronger routines. This means they can do more advanced and exciting routines! Stay tuned for our next installment of the figures topic where Coach Leah reveals the number one thing athletes can be doing to improve their figures score!